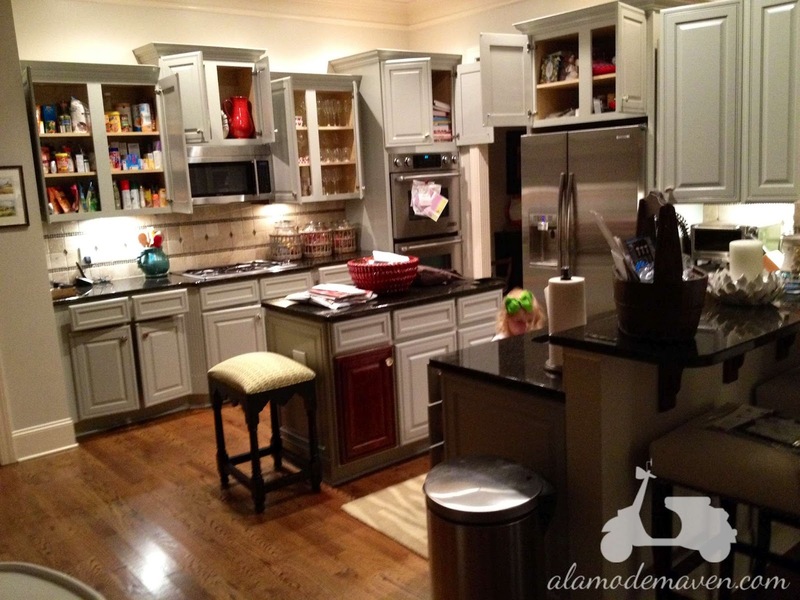 alamode: Kitchen Remodel Part 1- Refacing Of The Cabinets! Some of the doors and drawers had to stay open all night for drying purposes. The kitchen already looks bigger and brighter (even though this is a 10pm last night when we stumbled in from the airport....note tired 2 year old checking it all out). ps- try to overlook the STUFF EVERYWHERE. Keepin' it real. Did you notice the lone ranger cherry door? He is going to be removed and the carpenter will be installing the wine fridge here. Didn't Doug from Schreiner Painting Contractors of Tennessee do an amazing job? He is so professional and AWESOME to work with! He did this in TWO days!!! I'm amazed!! 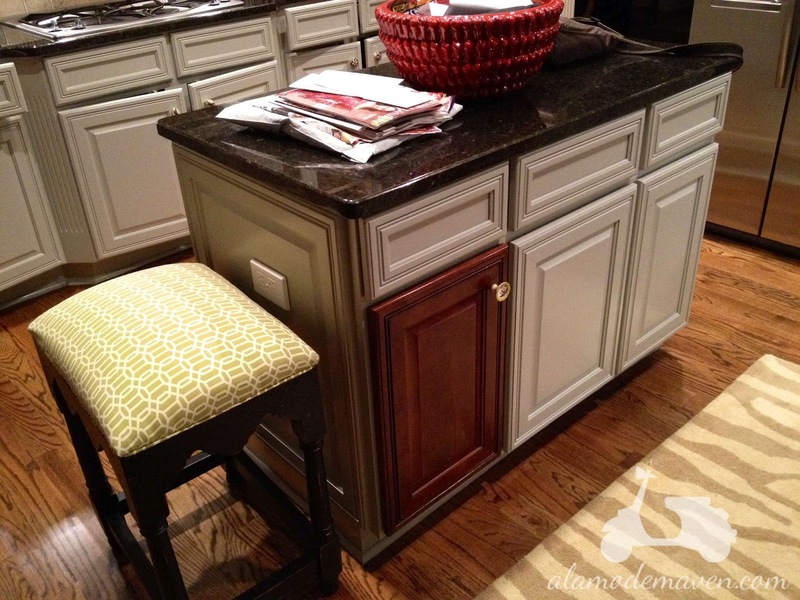 The cabinet color is Fieldstone by Benjamin Moore. Now I need to pick out pulls and knobs for the cabinetry in a shiney chrome. Any ideas out there??? Next up: Carpenter to install farm sink, wine fridge and knock down the useless 2 bar top. YAY!!! Looks fabulous- LOVE the colour! Looks amazing. love the color. We just redid our kitchen, fam. room & powder room. My house looks the same (with stuff everywhere!) Unfortunately couldn't sacrifice storage for a cool wine fridge! I got a farm sink too!! Can't wait to see more of your progress! I am blown away. You must be doing the biggest happy dance. SUCH a transformation. And in two days. You have to be kidding me. Does he commute. . . like to CA? It is looking fantastic! What a nice treat to walk in and see all of that done. 2 days is amazing! Hope you all had a great time away. I bet little K loved Disneyworld. wow! what a difference!! so much brighter. Why is the two level bar useless?